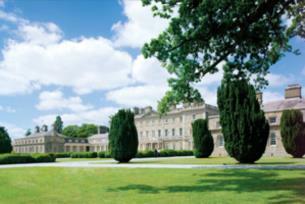 Twenty minutes from Dublin, Carton House is one of Ireland’s best located four star luxury resorts. Beautifully restored, Carton House has been discreetly converted into a modern luxury destination, nestled in 1,100 acres of parkland. Located just twenty minutes from Dublin, the Carton House Hotel is one of the best located luxury hotels in Ireland. The one thousand one hundred acre private, parkland estate, is an all - encompassing playground for leisure and corporate guests alike, featuring two championship golf courses, a leisure centre with pool, spa, training pitches, tennis courts, events centre and Ireland's premier corporate event company, Orangeworks, on its front doorstep. There are 165 bedrooms at the Carton House, one of the best located, four star luxury hotels Ireland has to offer, many with their own private balcony and all situated in the mature cedar tree estate. Each room in is accessed by gently curving low-lit corridors punctuated by floor-to-ceiling photographic lightboxes - each one displaying a unique architectural detail of the original house. All rooms have custom-made beds and gleaming bathrooms with walk-in mosaic power showers and most have separate bathtubs. Whether a light snack, a group event or an intimate meal, all tastes are catered for with an extensive wine list to complement a broad selection of dishes; served in either the relaxed, convivial atmosphere of the Kitchen Bar or the bright, fine dining of the Linden Tree Restaurant. With its unique backdrop and historic setting, the luxury Carton House, regarded as one finest wedding hotels Ireland has to offer, is no stranger in hosting extraordinary weddings in Ireland. Nearby attractions include the Japanese Gardens, the Irish National Stud and the Butterfly Exhibition.